QUESTION: A short strided horse adds a stride in a line, resulting in an even six strides in a five stride line. Do you penalize? Do you have the same answer for an equitation class? 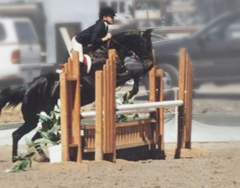 Hunter and equitation courses consist of eight fences in two or more “lines” of fences. For example, the course designer might set two jumps in a line measuring 72 feet, allowing for five 12-foot strides, and an additional six feet for the landing of fence 1 and the take-off of fence 2. Sometimes a short-strided horse may canter the line and fit in an even six strides; another longer strided horse may easily put four strides in between the fences. The question asks our judges to estimate the degree of penalization with regards to adding a stride in a related distance between fences.